A leading Shropshire law firm is continuing its arts sponsorship programme. Wace Morgan Solicitors, based in St Mary’s Street, is providing backing for several Shropshire events this year. As part of its community involvement, the firm recently sponsored A Tale of Two Cities at the Theatre Severn, produced by Shrewsbury Amateur Operatic Society. 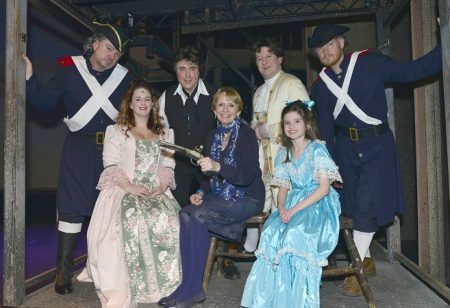 The show, based on Charles Dickens’s greatest work, was a huge success with local audiences. Later this month, the firm is one of the main supporters of Anything Goes, being staged by Mad Cow Productions from April 27 to 29, also at Theatre Severn. Cole Porter’s joyful, exuberant, first-class comedy is regarded as one of the best musicals in theatre history. At the end of April, Wace Morgan is sponsoring a visit by best selling author, national treasure and broadcaster Clare Balding as she introduces her very first children’s book ‘The Racehorse Who Wouldn’t Gallop’ at the Shrewsbury Children’s Bookfest on April 28 at Prestfelde School. She will share stories from her own childhood growing up surrounded by animals, offer expert advice and the event will end with an audience Q&A and a book signing. The Bookfest runs from April 28 to May 1.